The earthing system is installed to provide potential to earth for equipment and appliances within our installation. To try an remove any confusion, I will use the word EARTH in reference to the planet earth and PROTECTIVE EARTH for a conductor that has the potential of ZERO (green & yellow insulation). Our Earth has a potential of ZERO volts, therefore if we have a higher voltage than 0, the power will happily move from the higher voltage to the lower (current flow to earth). An example of this is when a fault occurs with a broken cable and it makes contact with the Earth, the power creates a circuit and large currents flows (explosion usually). We install protective eaths to ensure all equipment and appliance have conductive parts at a potential of 0 volts. By installing protective earths, we can ensure that if a active to earth fault occurs in our equipment or appliance, a circuit can be created, excess current will flow resulting in our circuit breaker operating. If a active to earth fault occured and we didnt have a protective earth, that appliance or equipment will the have the potential of the supply voltage and not create a circuit and remain live until a circuit is made (person touching it and earth). AS3000:2007 is broken up into 8 sections, section 5 is all about earthing. 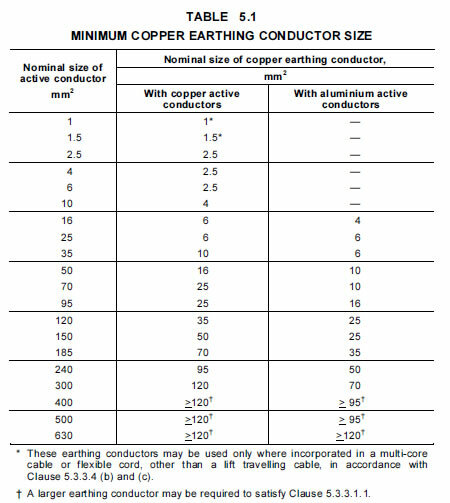 A table that is used offten is table 5.1, it contains minimum conductor sizes for earth. Fault loop impedance is a mandatroy test as stated in section 8 of AS3000:2007.